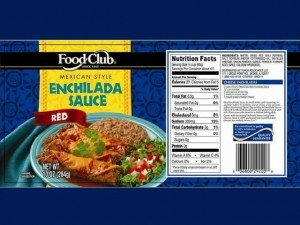 Los Angeles-based Bruce Foods Co. has announced a recall for its Food Club® “Red Enchilada Sauce” labeled products. This product is recalled because of a possible mislabeling of the product. The canned enchilada sauce products might possibly contain Green Enchilada sauce instead of the red one. Green enchilada sauce contains soy and wheat, which are common food allergens that could trigger an allergy attack to those who are hypersensitive to it. Only red enchilada labeled cans with the ECH 451244 code are affected by the recall. The best-by date indicated in the cans is 5/13/2015. Each can has a net weight of 10 ounces. Other sauces manufactured by the company that do not have these specifications are not affected by the recall. The recalled sauces were distributed to the states of Texas, Minnesota, Ohio, Virginia and Alabama from May 31 to July 2. In worst cases, an allergy attack could lead to serious health emergencies, even death. This incident can possibly happen to children, the elderly, or those people who already have existing medical conditions prior to the allergy attack. The recall was made immediately after a mislabeled can was discovered. Prior to the time of the recall announcement, no allergy attacks related to the product was reported. Consumers who bought the recalled mislabeled products are urged to have it replaced at the store or have it refunded. They may also call the Bruce Foods’ hotline, 1-337-365-8101 for any questions they may have regarding the recall. They can ask for Larry Thibodeaux to answer their recall-related inquiries. The hotline is available from 8 AM until 5 PM, Central Standard Time. Enchiladas originated in Mexico, where the practice of rolling tortillas around other food dates back at least to Mayan times.The people living in the lake region of the Valley of Mexico traditionally ate corn tortillas folded or rolled around small fish.